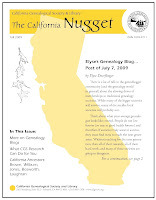 We hope you will enjoy the variety of articles and information in this second issue of The California Nugget. Be sure to read “Elyse’s Genealogy Blog” which describes a generation gap among family historians, and let us know what you think CGS might do to help unite researchers of all ages. (We’ve taken the ﬁrst step by adding a student membership at $20.) Our "California Ancestors" section highlights two very different BROWN families, and the ‘06 earthquake is memorialized by a BOSWORTH ancestor. In April 2010 the planets align when the annual National Genealogical Society Conference and the annual CGS research trip are back-to-back in Salt Lake City! The 2010 NGS Family History Conference is 28 April – 1 May 2010. There is a conference blog at http://conference.ngsgenealogy.org. Sign up now to take advantage of the week-long CGS trip—what a wonderful ten days for those who can be there for both events. Coming in the next issue of the Nugget: exciting details about a major new CGS publication, San Francisco Deaths, 1865 – 1904 and ﬁrst part of the alphabet from the newly compiled California Names in the Index to the List of Pensioners on the Roll, 1883. What about your California ancestors? Please share your stories, photos and family trees for our readers and your descendants! CGSL Blog in the News! I can not wait to get my copy...I am excited to see if the Browns are part of my lines! Please do come back and leave a comment if they are your BROWNs! 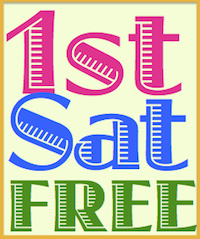 Fantastic site, great blog and tremendous resource for the California family. Definitely featured in the Californiality.com sidebar! Great info on California. I am planning a trip to CA this winter and was glad to find your site. Thanks for stopping by. I hope you'll visit our library if you make it to Oakland. O wow great stuff here guys! What a great resource thanks again!